Shelter, the UK housing and homelessness charity, has launched an integrated advertising campaign, “House of Cards”, featuring Radiohead’s track, “Videotape”, and a voice over by actress Samantha Morton. The organisation launched the campaign on February 9 with a television commercial, posters and a microsite, focusing on the vulnerability of people affected by repossession. The television commercial takes us through a housing estate, revealing buildings made of playing cards in various states of collapse. Samantha Morton, who herself experienced homelessness before she became famous, tells us that an estimated 75,000 homes will be repossessed in the next year. 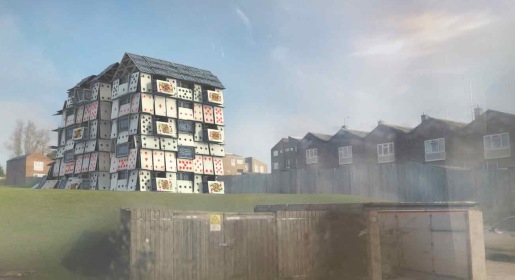 The Shelter House of Cards campaign was developed at Leo Burnett London by creative director Jonathan Burley, copywriters Daniel Fisher and Pete Gosselin, art directors Richard Brim and Jay Hunt. Animation/filming was directed by Dom and Nic (Dominic Hawley and Nick Goffey) via Outsider, London. Sound and music was mixed at Grand Central.